Rate this project SparkyLinux is a Debian-based distribution featuring many editions and desktop flavours. The project's latest release is SparkyLinux 5.3, which is a rolling release platform based on Debian's Testing branch. "Changes: Full system upgrade from Debian Testing repositories as of March 7, 2018; Linux kernel 4.15.4 as default (4.15.8 is available in Sparky 'unstable' repository); the default system installer, Calamares, updated up to version 3.1.12; added packages to support Btrfs and XFS file systems; cleaning out old file and configurations; added new tool for cleaning the system from old files and configurations - BleachBit; missing language package installer (a part of APTus) has gotten GNOME, KDE and Qt language package installation option; gdebi has been removed; local-stored debs can be installed via APTus, Install, Install package; CLI edition has been re-configured, it uses sudo as default after installing it on a hard drive as well." Further details can be found in the project's release announcement. Download (pkglist): sparkylinux-5.3-x86_64-mate.iso (1,523MB, SHA512, signature, torrent), sparkylinux-5.3-x86_64-xfce.iso (1,411MB, SHA512, signature, torrent), sparkylinux-5.3-x86_64-lxqt.iso (1,295MB, SHA512, signature, torrent). Also available from OSDisc. SparkyLinux is a Debian-based distribution which features many editions and different development branches. SparkyLinux's Stable series has received a minor update which brings the installation media up to date with upstream Debian software repositories. The new version is SparkyLinux 4.7, codename "Tyche". "There is an update of SparkyLinux 4.7 'Tyche' out there. This is Sparky edition based on Debian Stable version 9 code name 'Stretch'. No big changes, the new ISO images provide updates of all installed packages, from Debian 'Stretch' and Sparky repositories as of November 17, 2017. Highlights: Linux kernel 4.9 (4.9.51), Xfce 4.12.3, LXDE 0.99.2, Openbox 3.6.1, Firefox ESR 52.5.0, Thunderbird 52.4.0, Pidgin 2.12.0, HexChat 2.12.4, VLC 2.2.6, DeaDBeeF 0.7.2, LibreOffice 5.2.7, Transmission 2.92, Calamares 3.1.8." More information and upgrade instructions for existing SparkyLinux users can be found in the project's release announcement. Download (pkglist): sparkylinux-4.7-x86_64-lxde.iso (1,313MB, SHA512, signature, torrent), sparkylinux-4.7-x86_64-xfce.iso (1,327MB, SHA512, signature, torrent). SparkyLinux is a Debian-based lightweight and fast Linux distribution designed to run on both old and new computers. The project's latest release, SparkyLinux 5.1, is based on Debian's Testing branch, codename Buster and offers a rolling release upgrade path. "Changes between version 5.0 and 5.1: full system upgrade from Debian testing repos as of September 25, 2017; Linux kernel 4.12.13 as default (4.13.3-sparky is available in Sparky 'unstable' repo); gcc 6 removed from the live media, the default compiler is gcc 7; - obmenu-generator updated up to version 0.80 (MinmalGUI edition), what speeded up launching the menu with SVG icons; the default system installer Calamares updated up to version 3.1.4; added new tool for installing a web browser: Sparky Web Browser Installer; new desktop environment added to Sparky repos: Manokwari; live system's memtest86+ issue has been fixed." Further information can be found in the project's release announcement. Download (pkglist): sparkylinux-5.1-x86_64-lxqt.iso (1,307MB, SHA512, signature, torrent), sparkylinux-5.1-x86_64-mate.iso (1,555MB, SHA512, signature, torrent), sparkylinux-5.1-x86_64-xfce.iso (1,419MB, SHA512, signature, torrent). The SparkyLinux team has announced the release of SparkyLinux 5.0. The new release is based on Debian's Testing branch and is available in three editions: LXQt, MATE and Xfce. "Sparky "Home" edition provides fully featured operating system with lightweight desktops: LXQt, MATE and Xfce. As usually, Sparky MinimalGUI (Openbox) and MinimalCLI (text based) lets you install the base system with a minimal set of applications and a desktop of your choice, via the Sparky Advanced Installer. Changes between version 4.5 and 5.0: full system upgraded from Debian Testing repos as of July 14, 2017; Linux kernel 4.11.6 as default (4.12.x is available in Sparky Unstable repo); new theme 'Sparky5'; new theme of LXQt edition; new default wallpaper created by our community member 'barti'; new set of wallpapers of the Nature category, with a few nice landscapes from Poland; Calamares 3.1.1 as the default system installer; new tool for checking and displaying notification on your desktop about available updates." More information on SparkyLinux 5.0 can be found in the project's release announcement. Download (pkglist): (1,173MB, SHA512, signature, torrent), sparkylinux-5.0-x86_64-mate.iso (1,421MB, SHA512, signature, torrent), sparkylinux-5.0-x86_64-xfce.iso (1,292MB, SHA512, signature, torrent). The SparkyLinux distribution is a Debian-based project which typically tracks Debian's Testing branch to provide a lightweight, friendly desktop operating system. Following the release of Debian 9, the SparkyLinux team has announced the launch of SparkyLinux 4.6 which is built using software from Debian's Stable branch. "There are new live/install ISO images of SparkyLinux 4.6-STB 'Tyche' available to download. This is the first Sparky edition based on Debian Stable line 9 codename 'Stretch'. Sparky 'Home' edition provides fully featured operating system with two lightweight desktops: LXDE and Xfce. Sparky 'MinimalGUI' and 'MinimalCLI' let you install the base system with a minimal set of applications and a desktop of your choice, via the Sparky Advanced Installer." The new version ships with Linux kernel 4.9 (with newer kernels available in SparkyLinux's Unstable repository) and the Icedove e-mail client has been replaced by Thunderbird. The release announcement for SparkyLinux 4.6 offers further information and a list of changes since the previous 4.5 release. Download (pkglist): sparkylinux-4.6-x86_64-lxde-stb.iso (1,303MB, SHA512, signature, torrent), sparkylinux-4.6-x86_64-xfce-stb.iso (1,318MB, SHA512, signature, torrent). The SparkyLinux distribution is based on Debian's Testing branch and is available in several editions. The project's latest release, SparkyLinux 4.4, is available in five different desktop flavours. The new version offers updated packages for the kernel and Firefox. The ability to easily install additional desktops, including PekWM, Trinity and Lumina, through the APTus utility has been added. "New, updated live/install ISO images of SparkyLinux 4.4 'Tyche' are available for download now. As before, SparkyLinux 'Home' editions provide full-featured operating system based on Debian 'Testing', with desktops of your choice - LXDE, LXQt, KDE, MATE and Xfce. Changes between versions 4.3 and 4.4: full system upgrade as of August 15, 2016; Linux kernel 4.6.4 (4.7.1 is available in Sparky repositories); Firefox 45.3.0 ESR (Firefox 48 is available in repositories); Calamares is available...." Additional information can be found in the project's release announcement. Download (pkglist): sparkylinux-4.4-x86_64-lxde.iso (1,547MB, SHA512, signature, torrent), sparkylinux-4.4-x86_64-mate.iso (1,673MB, SHA512, signature, torrent), sparkylinux-4.4-x86_64-kde.iso (1,659MB, SHA512, signature, torrent), sparkylinux-4.4-x86_64-xfce.iso (1,563MB, SHA512, signature, torrent), sparkylinux-4.4-x86_64-lxqt.iso (1,348MB, SHA512, signature, torrent). Pawel Piganowski has announced the release of SparkyLinux 4.3. The Sparky Linux distribution is based on Debian's Testing branch and provides users with a variety of desktop editions. In the latest release, the Linux kernel has been updated to version 4.5.1, the Iceweasel web browser has been replaced with Firefox and the Turpial microblogging client was replaced with Corebird. "New, updated ISO images of SparkyLinux 4.3 'Tyche' are available now. As before, Sparky 'Home' editions provide fully featured operating system based on the Debian Testing, with desktops of your choice: LXDE, LXQt, KDE, MATE and Xfce." A complete list of changes to the distribution can be found in the project's release announcement. Download (pkglist): sparkylinux-4.3-x86_64-lxde.iso (1,528MB, SHA512, signature, torrent), sparkylinux-4.3-x86_64-mate.iso (1,647MB, SHA512, signature, torrent), sparkylinux-4.3-x86_64-xfce.iso (1,516MB, SHA512, signature, torrent), sparkylinux-4.3-x86_64-kde.iso (1,626MB, SHA512, signature, torrent), sparkylinux-4.3-x86_64-lxqt.iso (1,318MB, SHA512, signature, torrent). The SparkyLinux team has announced the availability of a new testing release. The new development snapshot, SparkyLinux 4.3-dev3, features the Firefox ESR web browser, Linux kernel 4.4.6 and improvements to the system installer. "This is the 3rd and probably the last development version of SparkyLinux 4.3-dev3 MinimalISO. Changes between Sparky 4.3-dev2 and dev3: Improved the Sparky Advanced Installer: Added 4 more desktops: bspwm, i3, Pantheon and Window Maker. Added more options to be saved in the log file; if any problem occurs with the advanced installer, provide /var/log/sparkylinux-installer.log file. Iceweasel changed back to Firefox (is in Debian Testing repository), so the Advanced Installer offers you Firefox-ESR instead of Iceweasel now..." More information can be found in the project's release announcement. Download (pkglist): sparkylinux-4.3-dev3-x86_64-minimalgui.iso (881MB, SHA512, torrent, signature). Paweł Pijanowski has announced the launch of SparkyLinux 4.2, the second update to the project's 4.x series. SparkyLinux is based on Debian's Testing "Stretch" branch and is available in several desktop editions. The new release features LibreOffice 5, Iceweasel (Firefox) 38 ESR and version 4.2 of the Linux kernel. SparkyLinux 4.2 also offers the Tor Messenger for private chat communications via the distribution's repositories. Further, two editions of the distribution have been discontinued and the translation system has been updated: "The latest poll has told which Sparky edition is not too popular, so these two editions have been dropped: JWM and CLI. Most Sparky tools have been re-configured and they use a simple localization system now. All of them use English and Polish language packages, and many of them, thanks to our community members, use other localizations now. The present status and files to be (still) translated are available at our wiki page." Further information can be found in the project's release announcement. Download (pkglist): sparkylinux-4.2-x86_64-lxde.iso (1,563MB, SHA512), sparkylinux-4.2-x86_64-mate.iso (1,662MB, SHA512), sparkylinux-4.2-x86_64-xfce.iso (1,549MB, SHA512), sparkylinux-4.2-x86_64-kde.iso (1,655MB, SHA512), sparkylinux-4.2-x86_64-lxqt.iso (1,384MB, SHA512). The developers of SparkyLinux, a desktop distribution based on Debian's testing branch, have released SparkyLinux 4.1 in several editions. The latest release features packages from Debian Stretch, version 5.2.1 of the GNU Compiler Collection, LibreOffice 5.0.1, systemd 226 and version 4.1.6 of the Linux kernel. "New ISO images of SparkyLinux 4.1 are ready to go. SparkyLinux 4 is based on and fully compatible with Debian testing 'Stretch'. It's the first update of SparkyLinux 4.x, which provides a few important changes, such as: full system upgrade from Debian testing repository as of 28 September 2015. Linux kernel 4.1.6, GCC 5.2.1, systemd 226, Plasma Desktop 5, LibreOffice 5.0.1." The new release includes some additional changes, for example the Adobe Flash player has been removed from the default installation, but is still available in the distribution's repositories. Further information on SparkyLinux 4.1 can be found in the project's release announcement. Download (pkglist): sparkylinux-4.1-x86_64-lxde.iso (1,618MB, SHA512, torrent), sparkylinux-4.1-x86_64-mate.iso (1,755MB, SHA512, torrent), sparkylinux-4.1-x86_64-xfce.iso (1,630MB, SHA512, torrent), sparkylinux-4.1-x86_64-kde.iso (1,710MB, SHA512, torrent), sparkylinux-4.1-x86_64-lxqt.iso (1,497MB, SHA512, torrent). 2015-09-03 Development Release: SparkyLinux 4.1 RC "Rescue"
The developers of SparkyLinux, a desktop distribution based on Debian, have announced the launch of a new release candidate. The new development version, SparkyLinux 4.1 RC "Rescue", is based on Debian's Testing branch and is designed to be used as a live rescue disc. "There is available a new, special edition of SparkyLinux 4.1 RC Rescue. The system is based on SparkyLinux 4 "Tyche" and fully compatible with Debian Testing 9 "Stretch". SparkyLinux Rescue is an operating system which works in live DVD/USB mode only. The live system contains a large set of tools for scanning and fixing files, partitions and operating systems installed on hard drives." The live disc includes backup utilities, partition managers, encryption tools, anti-virus software and several package managers. Further information and a list of included utilities can be found in the project's release announcement. Download: sparkylinux-4.1-rc-x86_64-rescue.iso (969MB, SHA256, torrent, pkglist). The developers of SparkyLinux, a distribution based on Debian's Testing branch (also know as Debian "Stretch"), have announced the availability of a new release. SparkyLinux 4.0 ships with version 4.0.5 of the Linux kernel, offers package compatibility with Debian "Stretch" and can be installed on machines featuring UEFI. "[The] 32-bit edition of SparkyLinux features Linux kernel i586 non-PAE. If you would like to install i686-pae kernel, you can do it via Sparky APTus-> Install tab-> Install i686-PAE Kernel. Just remember to refresh package list before. Starting from Sparky 4.0, the live images offer support for installing the system on 32-bit machines with UEFI motherboard. As an addition, all the traditional 'grub-efi' files have been removed from the live ISO images and replaced by our own, custom 'efi.img' files built by MoroS using his custom script." SparkyLinux is presently available in five different desktop editions (LXDE, LXQt, KDE, MATE and Xfce). Further information can be found in the project's release announcement. Downloads (pkglist): sparkylinux-4.0-x86_64-lxde.iso (1,476MB, SHA512, torrent), sparkylinux-4.0-x86_64-mate.iso (1,586MB, SHA512, torrent), sparkylinux-4.0-x86_64-xfce.iso (1,498MB, SHA512, torrent), sparkylinux-4.0-x86_64-kde.iso (1,459MB, SHA512, torrent), sparkylinux-4.0-i586-lxqt.iso (1,275MB, SHA512, torrent). A release candidate for SparkyLinux 4.0 has been released. The new release candidate updates many packages, offers a new theme and the XChat IRC client has been swapped out for HexChat. 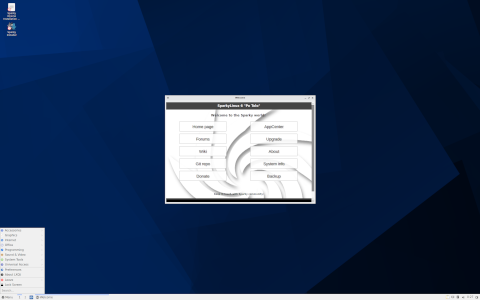 According to the release announcement SparkyLinux is offering two editions of the release candidate, one with the LXDE desktop and the other running Openbox as the default graphical user interface. "I am happy to announce SparkyLinux 4.0 RC. The new ISO images provide the release candidate, before the final version of 4.0 will be out. SparkyLinux 4.0 RC is available in two versions: LXDE - our flagship edition with lightweight LXDE desktop, full set of selected applications and functions. Openbox - a base edition with ultra lightweight Openbox desktop, which gives a nice and solid base to build personalized desktop on the top of Debian 'Testing'." Download (SHA256, pkglist): sparkylinux-4.0-rc-x86_64-lxde.iso (1,505MB, SHA256), sparkylinux-4.0-rc-x86_64-openbox.iso (792MB, SHA256). 2015-01-04 Distribution Release: SparkyLinux 3.6 "GameOver"
Paweł Pijanowski has announced the release of SparkyLinux 3.6 "GameOver" edition, the project's special edition designed for gamers: "SparkyLinux 3.6 'GameOver' is out. GameOver is a special edition of SparkyLinux targeted at game players. It has been built on the top of SparkyLinux 3.6 'Annagerman' and it's fully compatible with Debian's 'testing' branch. What is under the hood of GameOver 3.6? Linux kernel 3.16.7; all packages upgraded from Debian's testing repositories as of 2014-12-31; lxde-common 0.99.0, Openbox 3.5.2, PCManFM 1.2 3, Iceweasel 34.0, VLC 2.2.0-rc2; Steam and Steam Launcher 1.0.0.49; Desura for Linux; WINE and PlayOnLinux. The Liquorix repository is enabled as default, it lets you upgrade the Linux kernel up to version 3.18 and WINE up to version 1.7 after installing SparkyLinux on a hard drive." Read the rest of the release announcement for more details and screenshots. Download: sparkylinux-3.6-x86_64-gameover.iso (3,890MB, MD5). 2014-12-08 Distribution Release: SparkyLinux 3.6 "LXDE", "MATE", "Razor-qt", "Xfce"
Paweł Pijanowski has announced the release of SparkyLinux 3.6, a set of lightweight Debian-based distributions with a choice of LXDE, MATE, Razor-qt and Xfce desktops: "I am happy to announce the fourth release, and the last this year, of SparkyLinux - 3.6 'Annagerman' LXDE, MATE, Razor-qt and Xfce. At the beginning, I’d like to thank all of our small but strong community members for their help with searching and solving bugs and problems. SparkyLinux 3.6 provides (as usual) all package updates, some bug fixes and small improvements, such as: Linux kernel 3.16.7, Xfce 4.10.1, LXDE 0.99.0, Razor-qt 0.5.2, MATE 1.8.1, Openbox 3.5.2; Twitter's microblogging client Hotot has been replaced by Turpial; the new wallpaper 'Vortex'; Sparky Conky Manager updated to version 0.1.7 with a new battery status applet...." Read the rest of the release announcement for further details. Download links (pkglist): sparkylinux-3.6-x86_64-lxde.iso (1,489MB, MD5), sparkylinux-3.6-x86_64-mate.iso (1,598MB, MD5), sparkylinux-3.6-x86_64-razorqt.iso (1,488MB, MD5), sparkylinux-3.6-x86_64-xfce.iso (1,502MB, MD5). 2014-09-26 Distribution Release: SparkyLinux 3.5 "MATE", "Xfce", "Openbox", "JWM"
Paweł Pijanowski has announced the availability of several new editions of SparkyLinux 3.5, a set of lightweight Debian-based distributions for the desktop: "SparkyLinux 3.5 'Annagerman' MATE, Xfce, Openbox and JWM is out. The new live/install ISO images provide package updates and a few changes. All packages have been synchronized with Debian's 'Testing' repository as of 2014-09-22. The Base edition is now available in two separated flavours - Openbox and JWM. The JWM edition offers traditional desktop look and a minimal set of applications. JWM uses even less power than Openbox and can be used on old machines. Sparky JWM 32-bit consumes less that 90 MB of RAM after installation. All multimedia packages have been removed from the Base editions. The system runs on Linux kernel 3.14.15 and offers MATE 1.8.1, Xfce 4.10.1, Openbox 3.2.5 and JWM 2.1.0." Here is the full release announcement. Download links: sparkylinux-3.5-x86_64-mate.iso (1,566MB, MD5), sparkylinux-3.5-x86_64-xfce.iso (1,462MB, MD5), sparkylinux-3.5-x86_64-openbox.iso (711MB, MD5), sparkylinux-3.5-x86_64-jwm.iso (687MB, MD5). 2014-09-06 Distribution Release: SparkyLinux 3.5 "LXDE", "Razor-qt", "E18", "E19-dev"
2014-07-08 Distribution Release: SparkyLinux 3.4 "GameOver"
Paweł Pijanowski has announced the release of SparkyLinux 3.4 "GameOver" edition, a Debian-based distribution designed for gaming enthusiasts: "SparkyLinux 3.4 'GameOver' is out. It has been built on the top of SparkyLinux 3.4 'Annagerman' and it's fully compatible with Debian's 'testing' repository. 'GameOver' is a special edition of Sparky targeted to game players. 'GameOver' 3.4 features: access to games compiled for Linux platform; access to 'popular' and 'modern' games via Steam and Desura platforms; access to many games created for MS Windows platform via Wine and PlayOnLinux; access to 'old' games created for discontinued machines and systems via emulators. What's under the hood of GameOver 3.4: Linux kernel 3.14.7; all packages upgraded from Debian's testing repositories as of 2014-07-03; LXDE 0.5.5, Openbox 3.5.2, PCManFM 1.2.0, Iceweasel 30.0 and a few important applications; support for installation on machines with EFI; systemd is the default init system now...." Here is the full release announcement with a screenshot. Download: sparkylinux-3.4-x86_64-gameover.iso (3,818MB, MD5). 2014-06-27 Distribution Release: SparkyLinux 3.4 "MATE", "Xfce", "Base"
Paweł Pijanowski has announced the release of SparkyLinux 3.4 "MATE", "Xfce" and "Base" (Openbox) editions, a set of Debian-based distributions with several lightweight desktop user interfaces: "SparkyLinux 3.4 'Annagerman' MATE, Xfce and Base (Openbox) is out. As usually, the new ISO images of SparkyLinux provide tons of updates, some changes and system improvements, such as: Linux kernel 3.14; all packages upgraded from Debian's 'Testing' repository as of 2014-06-23; MATE 1.8; Openbox 3.5.2; Xfce 4.10; support for installation on machines with EFI; systemd is the default init system now; menu of Openbox (Base edition) has got a few extra scripts; added new package - hardinfo; teamviewer has been updated up to version 9. New application in SparkyLinux repository: sparky-live-usb-creator – a tool for creating bootable live USB disks, it's a GUI front-end for the 'dd' command." Here is the brief release announcement. Download: sparkylinux-3.4-x86_64-mate.iso (1,540MB, MD5), sparkylinux-3.4-x86_64-xfce.iso (1,464MB, MD5), sparkylinux-3.4-x86_64-base.iso (661MB, MD5). 2014-06-03 Distribution Release: SparkyLinux 3.4 "LXDE", "E18", "Razor-qt"
Paweł Pijanowski has announced the release of SparkyLinux 3.4 "LXDE", "E18" and "Razor-qt" editions, a set of Debian-based distributions with a choice of three lightweight desktop interfaces: "SparkyLinux 3.4 'Annagerman' LXDE, Razor-qt and Enlightenment 18 is out. The new ISO images of SparkyLinux 3.4 provide tons of updates, changes and system improvements, such as: Linux kernel 3.14; all packages upgraded from Debian's 'testing' repositories as of 2014-05-31; LXDE 0.5.5; Openbox 3.5.2; Razor-qt 0.5.2; Enlightenment has been updated up to version 18 (0.18.2/0.18.5); support for installation on machines with EFI; systemd is the default init system now; Sparky Center – our system control center for LXDE desktop has been rebuilt, added tabs for every option and upgraded to version 0.2.1...." See the release announcement for more details and screenshots. Download links: sparkylinux-3.4-x86_64-lxde.iso (1,413MB, MD5), sparkylinux-3.4-x86_64-e18.iso (1,449MB, MD5), sparkylinux-3.4-x86_64-razorqt.iso (1,370MB, MD5). 2014-03-18 Distribution Release: SparkyLinux 3.3 "MATE", "Xfce", "Base"
Paweł Pijanowski has announced the release of SparkyLinux 3.3 "MATE", "Xfce", and the newly introduced "Base" (Openbox) editions, a set of Debian-based distributions featuring various lightweight desktop user interfaces: "SparkyLinux 3.3 'Annagerman' MATE, Xfce, and Base is out. New ISO images of SparkyLinux provide updates and some improvements. All packages upgraded from Debian testing repositories as of 2014/03/16. This is the end of Sparky Ultra and CLI Editions. Instead of them, there is a new 'Base' Edition which is a combination of Ultra and CLI. Sparky Base Edition is targeted to people who want to build their own desktop on the top of Debian testing base. Compared to the CLI Edition, Sparky 'Base' works in graphical mode so it will be much easier to install and configure additional applications than before. Sparky Base is very light and its size is about 600 MB. The 'new' installer is recommended for a hard drive installation." Check the release announcement for further details. Download links: sparkylinux-3.3-x86_64-mate.iso (1,540MB, MD5), sparkylinux-3.3-x86_64-xfce.iso (1,423MB, MD5), sparkylinux-3.3-x86_64-base.iso (576MB, MD5). 2014-03-07 Distribution Release: SparkyLinux 3.3 "LXDE", "E17", "Razor-qt"
Paweł Pijanowski has announced the release of SparkyLinux 3.3 "LXDE", "E17" and "Razor-qt" editions, a set of Debian-based distributions featuring the three lightweight desktop user interfaces: "SparkyLinux 3.3 'Annagerman' LXDE, Razor-qt and E17 is out. The new ISO images of SparkyLinux provide tons of updates, some changes and system improvements, such as: Linux kernel 3.12; all packages upgraded from Debian's 'testing' repositories as of 2014-03-04; new installer forked from LMDE/SolydXK (no support for EFI yet); new wallpaper 'Strange Nature' and artwork of GRUB, Plymouth and installer based on the wallpaper; sudo is active by default after installation; SparkyLinux default repository has been changed; new, refreshed logo. The old installer is still available in the live system and it is recommended for old machines." Read the release announcement for more details. Download links: sparkylinux-3.3-x86_64-lxde.iso (1,428MB, MD5), sparkylinux-3.3-x86_64-e17.iso (1,440MB, MD5), sparkylinux-3.3-x86_64-razorqt.iso (1,379MB, MD5). 2014-01-31 Distribution Release: SparkyLinux 3.2.1 "Xfce"
Paweł Pijanowski has announced the release of SparkyLinux 3.2 "Xfce" edition, the latest addition to the growing number of the project's family of Debian-based distributions: "SparkyLinux 3.2.1 Xfce is based on the 3.2 release and it's fully compatible with Debian 'Jessie'. SparkyLinux 'Xfce' has a few new features which will also be added to the next SparkyLinux release. So what is under the hood? Linux kernel 3.12; all packages upgraded from Debian's testing repositories as of 2014-01-29; Xfce 4.10; the same set of tools and applications which can be found in all SparkyLinux spins; added a boot-repair tool; added Plymouth with a Sparky theme; the uGet download manager has been upgraded from Debian's 'Sid' repository, it uses aria2 for downloading files as default; Iceweasel has been synchronised with uGet via the FlashGot add-on – downloading big files has never been so easy; added the Hotot microblogging client...." Here is the full release announcement. Download: sparkylinux-3.2.1-x86_64-xfce.iso (1,349MB, MD5). 2013-12-28 Distribution Release: SparkyLinux 3.2 "GameOver"
Paweł Pijanowski has announced the release of SparkyLinux 3.2 "GameOver" edition, a Debian-based distributions for gamers: "SparkyLinux 3.2 'GameOver' is out. It has been built on top of SparkyLinux 3.2 'Annagerman' and it's fully compatible with Debian 'Jessie'. SparkyLinux 'GameOver' is a special edition of our distro targeted at game players. 'GameOver' 3.2 offers: access to games compiled for the Linux platform; access to 'popular' and 'modern' games via Steam and Desura platforms; access to many games created for MS Windows platform via WINE and PlayOnLinux; access to 'old' games created for machines via emulators What's under the hood of GameOver 3.2: Linux kernel 3.11.10; all packages upgraded from Debian's testing repositories as of 2013-12-22; LXDE 0.5.5, Openbox 3.5.2, PCManFM 1.1.2 and a few important applications; 3rd party applications - Steam, Desura and Dropbox clients; WINE 1.4.1 and PlayOnLinux 4.2.1...." Read the rest of the release announcement for more details. Download: sparkylinux-3.2-x86_64-gameover.iso (3,720MB, MD5). 2013-12-17 Distribution Release: SparkyLinux 3.2 "E17", "MATE", "CLI"
Paweł Pijanowski has announced the release of SparkyLinux 3.2 "E17", "MATE" and "CLI" editions, a set of Debian-based distributions with Enlightenment, MATE or command-line only user interfaces: "SparkyLinux 3.2 'Annagerman' Enlightenment, MATE & CLI is out. The new live/install media of SparkyLinux 3.2 E17, MATE and CLI feature: Linux kernel 3.11.10; all packages have been upgraded from Debian's testing repositories as of 2013-12-15; MATE 1.6; Enlightenment 0.17.3; PCManFM 1.1.2 (E17 desktop); added support for installing 32-bit applications on 64-bit systems; added the 32-bit WINE package on 64-bit systems; added the cURL package – it's a missing dependency for PlayOnLinux; sparky-aptus has been updated up to version 0.1.6 – added new option 'Fix Broken DPKG'." Here is the brief release announcement. Download: sparkylinux-3.2-x86_64-e17.iso (1,625MB, MD5), sparkylinux-3.2-x86_64-mate.iso (1,745MB, MD5), sparkylinux-3.2-x86_64-cli.iso (556MB, MD5). 2013-12-10 Distribution Release: SparkyLinux 3.2 "LXDE", "Ultra", "Razor-qt"
Paweł Pijanowski has announced the availability of three new editions of SparkyLinux 3.2, a set of Debian-based distributions with lightweight desktop user interfaces: "New DVD images of SparkyLinux 3.2 providing a few changes and system improvements, such as: Linux kernel 3.11.8; all packages have been upgraded from Debian's 'testing' repositories as of 2013-12-07; added support for installing 32-bit applications on 64-bit systems; 32-bit WINE package has been installed on 64-bit systems; Sparky Center LXDE and Sparky Center Openbox have been reconfigured - some applications have been extracted from sparky-center and packed separately so they can be installed on other Sparky desktops with no sparky-center; added the cURL package curl – it's a missing tool requires by PlayOnLinux...." See the full release announcement for more details. Download: sparkylinux-3.2-x86_64-lxde.iso (1,591MB, MD5), sparkylinux-3.2-x86_64-ultra.iso (1,485MB, MD5), sparkylinux-3.2-x86_64-razorqt.iso (1,532MB, MD5). 2013-10-08 Distribution Release: SparkyLinux 3.1 "E17", "MATE", "Razor-qt"
Paweł Pijanowski has announced the release of SparkyLinux 3.1 "E17", "MATE" and "Razor-qt" editions, a set of Debian-based distributions and live CDs featuring three popular lightweight desktop user interfaces: "SparkyLinux 3.1 'Annagerman' E17, MATE and Razor-qt editions are out. The new ISO images of SparkyLinux provide a few changes and system improvements, similar to last week's release of SparkyLinux 3.1 LXDE, Ultra and CLI: Linux kernel 3.10.11; all packages have been updated from Debian's testing repositories as of 2013-10-05; Sparky Backup System - one more bug fixed, updated up to 0.1.5; Enlightenment 17 desktop is available as a separated ISO image now and it has been updated to version 0.17.3 from Debian's unstable repository; added Teamviewer client, Sparky APTus, Minitube, Gnote, Osmo, Radiotray and Xfburn. New forum for English speakers is also available." Here is the brief release announcement. Download: sparkylinux-3.1-x86_64-e17.iso (1,557MB, MD5), sparkylinux-3.1-x86_64-mate.iso (1,670MB, MD5), sparkylinux-3.1-x86_64-razorqt.iso (1,445MB, MD5). Paweł Pijanowski has announced the release of SparkyLinux Linux 3.1, a set of lightweight Debian-based distributions coming in "LXDE", "Ultra" (with Openbox and JWM) and "CLI" flavours: "SparkyLinux 3.1 'Annagerman' LXDE, Ultra and CLI are out. New ISO images of SparkyLinux 3.1 providing a few changes and system improvements, such as: Linux kernel 3.10.11; all packages have been updated from Debian's 'testing' repositories as of 2013-09-27; added a TeamViewer client for remotely controlling other machines; added Sparky APTus - a small, simple and lightweight front-end for apt-get for upgrading and cleaning up the system, installing and removing packages; added Minitube - a lightweight video player for YouTube videos; added Gnote - a lightweight notes taking utility; added Osmo - a lightweight personal organizer; added Radio Tray - a very small application for listening to Internet radio...." Here is the brief release announcement. Download: sparkylinux-3.1-x86_64-lxde.iso (1,508MB, MD5), sparkylinux-3.1-x86_64-ultra.iso (1,408MB, MD5). 2013-08-07 Distribution Release: SparkyLinux 3.0 "GameOver"
SparkyLinux 3.0 "GameOver" edition, a lightweight, fast, and simple Linux distribution designed for both old and new computers, has been released: "'GameOver' 3.0 is built on SparkyLinux 3.0 'Annagerman' and compatible with the 'testing' branch of Debian GNU/Linux 'Jessie'. Sparky 3.0 'GameOver' features Linux kernel 3.9.8-1; all packages updated from Debian testing repositories as of 2013/08/02; sparky-installer bug has been fixed; added new tools: blueman, ddm, disk-manager, dropbox client, gponting-device-settings, hardinfo, htop, joystick, jstest-gtk, lxtask, matchbox-keyboard, rcconf, uget; added new games: blobby, blockout2, brainparty, chromium-bsu, flare, funnyboat, lbreakout2, ltris, minetest, pingus, smc (Secret Maryo Chronicles), teeworlds, tetzle, widelands...." Read the rest of the release announcement for further information like how to log into the live system. Download: sparkylinux-3.0-gameover-i486.iso (3,834MB, MD5). Paweł Pijanowski has announced the final release of SparkyLinux 3.0, a Debian-based distribution with a choice of LXDE (default), Enlightenment, Openbox, JWM, MATE and Razor-qt desktop user interfaces: "SparkyLinux 3.0 'Annagerman' is out. SparkyLinux 3.x is built on the 'testing' branch of Debian GNU/Linux. The final release of Sparky 3.0 features: Linux kernel 3.9.8; all packages updated from Debian's testing repositories as of 2013-07-21; minor bug fixes; small improvements on all the desktops; new Sparky3 theme compatible with GNOME 3.8; added extra functionality to the CLI edition (former name 'Core')." Here is the full release announcement with a screenshot. Download: sparkylinux-3.0-x86_64.iso (LXDE and Enlightenment, 1,531MB, MD5), sparkylinux-3.0-x86_64-ultra.iso (Openbox and JWM, 1,326MB, MD5), sparkylinux-3.0-x86_64-mate.iso (MATE, 1,555MB, MD5), sparkylinux-3.0-x86_64-razorqt.iso (Razor-Qt, 1,379MB, MD5). Paweł Pijanowski has announced the availability of the release candidate for SparkyLinux 3.0, a Debian-based distribution with a choice of LXDE (default), Enlightenment, Openbox, JWM, MATE and now also Razor-qt desktop user interfaces: "SparkyLinux 3.0 RC 'Annagerman' is out. The release candidate of SparkyLinux 3 provides a few more changes and system improvement, such as: all packages have been synchronized with Debian 'testing' repositories as of 2013-07-06; Linux kernel 3.9; SparkyBackup system has additional support for JWM desktop; SparkyBackup Apss Copy & Recovery has been enhanced and supports 15 applications now; added new application - sparky-screenshot, a simple GUI for scrot; added new application - sparky-gexec...." Continue to the release announcement for full details. Download: sparkylinux-3.0-rc-x86_64.iso (LXDE and Enlightenment, 1,544MB, MD5), sparkylinux-3.0-rc-x86_64-ultra.iso (Openbox and JWM, 1,338MB, MD5), sparkylinux-3.0-rc-x86_64-mate.iso (MATE, 1,568MB, MD5), sparkylinux-3.0-rc-x86_64-razorqt.iso (MATE, 1,375MB, MD5). Paweł Pijanowski has announced the availability of the second beta release of SparkyLinux 3.0, a Debian-based distribution with a choice of LXDE (default), Enlightenment, Openbox, JWM and MATE desktop user interfaces: "SparkyLinux 3.0 beta 2 'Annagerman' has been released. Sparky 3.x has been built from the 'testing' branch of Debian GNU/Linux. SparkyLinux 3.0 beta 2 provides more changes and system improvements, such as: all packages have been synchronized with the Debian 'testing' repositories as of 2013-06-17; added new applications - Device Driver Manager (a tool to help users install third-party hardware drivers) and NDISwrapper (allowing an easy way to install Windows wireless drivers); bug fixing and new features - version 0.1.4 of the LXDE desktop; added SparkyLinux repositories and public keys...." Here is the brief release announcement. Download: sparkylinux-3.0-beta2-x86_64.iso (LXDE and Enlightenment, 1,538MB, MD5), sparkylinux-3.0-beta2-x86_64-ultra.iso (Openbox and JWM, 1,372MB, MD5), sparkylinux-3.0-beta2-x86_64-mate.iso (MATE, 1,555MB, MD5). Paweł Pijanowski has announced that the first beta release of SparkyLinux 3.0, a lightweight distribution based on Debian's "Testing" branch, is available for download and testing: "SparkyLinux 3.0 beta 1, code name 'Annagerman', is ready for testing. SparkyLinux 3 provides a few big changes, such as: over 20 pre-configured locales available at system startup; run SparkyLinux installer in text mode with no X server; from now, SparkyLinux live can use an existing swap partition; added a few new applications - LXMed, software center, xdg-user-dir, hardinfo, blueman, taskmanager, disk manager; SparkyCenter - a completely new application which gives you a quick access to the most important system settings. All packages have been synchronized with Debian 'Testing' repositories as of 2013-05-20." See the full release announcement for additional details and screenshots. Download: sparkylinux-3.0-beta1-x86_64.iso (1,850MB, MD5). 2013-04-26 Distribution Release: SparkyLinux 2.1.1 "MATE"
Paweł Pijanowski has announced the release of SparkyLinux 2.1.1 "MATE" edition, a Debian-based distribution featuring the latest release of the MATE desktop environment: "SparkyLinux 2.1.1 MATE edition is out. In the beginning of April, the MATE team published a new version of the MATE desktop environment, version 1.6. SparkyLinux 2.1 MATE edition featured MATE 1.4. It can be a little difficult to make a clear upgrade of MATE so I decided to build new ISO images which provide full system updates. What's new? Linux kernel 3.2.41; MATE 1.6 updated from MATE project's repository; rest of the packages have been updated from Debian testing repositories as of 2013-04-24. If you already updated with no problems, just ignore this message. If you found problems, backup your personal data and make fresh system installation overwriting the old one." Here is the brief release announcement. Download: sparkylinux-2.1.1-x86_64-mate.iso (1,529MB, MD5). 2013-03-28 Distribution Release: SparkyLinux 2.1 "GameOver"
Paweł Pijanowski has announced the release of SparkyLinux 2.1 "GameOver" edition, a Debian-based distribution with a customised LXDE desktop and a good collection of games: "Brand new, two-egged SparkyLinux 2.1 'GameOver' is out. It's the second, special edition of SparkyLinux 'GameOver' released for Easter 2013. It has been directly built on SparkyLinux 2.1 'Eris' and Debian 'Wheezy'. All packages have been synchronized with the Debian testing repository as of 2013-03-24. I made a few big changes so the system features: Linux kernel 3.2 i386 for old PCs and Linux kernel 3.8-liquorix (option) i686-pae for modern PCs designed for multimedia and gaming; glibc has been updated up to 2.17 from the experimental repository; Iceweasel, VLC, Leafpad, Pidgin, Transmission, XChat...." Read the rest of the release announcement for more info and screenshot. Download: sparkylinux-2.1-gameover.iso (3,294MB, MD5). Paweł Pijanowski has announced the release of SparkyLinux 2.1, a Debian-based desktop Linux distribution with a choice of Enlightenment, LXDE, MATE or Openbox desktops user interfaces: "I am happy to announce the final versions of SparkyLinux 'Eris' 2.1 E17/LXDE, 2.1 MATE edition and update of 2.1.1 Ultra edition. The ISO images provide bug fixes, updates and new features. All new images of SparkyLinux 'Eris' have been synchronised between themselves and all packages upgraded from Debian testing repository as of 2013-03-15. The new live system provides: Linux kernel 3.2.39; minor bugs fixes; live system on USB stick fixes; full system installation on USB stick; new set of wallpapers. The live system's user name is 'live', password 'live'." Here is the brief release announcement with a screenshot. Download: sparkylinux-2.1-eris-x86_64.iso (1,583MB, MD5), sparkylinux-2.1-eris-x86_64-mate.iso (1,526MB, MD5), sparkylinux-2.1.1-eris-x86_64-ultra.iso (1,289MB, MD5). Paweł Pijanowski has announced the availability of a release candidate for SparkyLinux 2.1, a Debian-based desktop Linux distribution with a choice of Enlightenment or LXDE desktops: "SparkyLinux 2.1 release candidate 'Eris' (Main edition) is out. The system is built as all 2.x releases on Debian testing 'Wheezy'. New ISO images E17/LXDE providing a lot of updates, bug fixing and new features, such as: Linux kernel 3.2.35; Enlightenment 0.17.1; all packages have been updated; fixed USB live system works; added full system installation on USB stick; new wallpapers and LaGaDesk-BlackWhite icon set; added 12 new Enlightenment themes. To change the desktop between E17 and LXDE while in live mode log out and log in back with user - live, password - live. Test SparkyLinux and report any bugs please." Here is the brief release announcement with a screenshot. Download: sparkylinux-2.1-rc-x86_64.iso (165MB, MD5). 2013-01-30 Distribution Release: SparkyLinux 2.1 "Ultra"
Paweł Pijanowski has announced the release of SparkyLinux 2.1 "Ultra" edition, a Debian-based lightweight distribution with Openbox as the default desktop user interface: "SparkyLinux 2.1 'Ultra' edition has been released. The system is built on Debian 'Wheezy' and all packages have been synchronized with Debian's testing repositories as of 2013-01-23. It features a customized, ultra-light and fast Openbox desktop. What else? Fluxbox is out - I wasn't happy with it so I focus all my attention on Openbox; standard Openbox exit options changed to 'Shutdown', 'Reboot' and 'Log out'; added update-manager; the Polish repository mirror server replaced with the main Debian one; added a few new wallpapers; added to menu - run application, graphical two-panel file manager Tux Commander to have quick access to system files, added AppFinder...." Read the full release announcement for system requirements and a screenshot. Download: sparkylinux-2.1-eris-x86_64-ultra.iso (1,369MB, MD5). Paweł Pijanowski has announced the release of SparkyLinux 2.0.1, a lightweight Debian-based distribution featuring a customised LXDE desktop and plenty of games: "SparkyLinux 2.0.1 'GameOver'. No, it's not the end of the project. It's brand new release. This idea was waiting in my Tomboy for the whole year. Finally I got back to work and three weeks later it's ready to go. It was built on the latest release of SparkyLinux 2.0 and it's designed for games players. Many applications have been removed from the system and replaced by games. The main system is based on Debian 'Wheezy' and has LXDE as the default desktop. All packages has been synchronised with Debian's 'testing' repositories as of 2012-12-12. What's under the hood: Linux kernel 3.2, LXDE, Iceweasel, VLC, Leafpad, Pidgin, Transmission, XChat, Flash, Java, multimedia codecs, VLC plugin for Iceweasel...." See the release announcement for a full list of included games and a screenshot. Download: sparkylinux-2.0.1-gameover-i386.iso (3,913MB, MD5).